Book must be a Romance. Only novel/novella length works will be accepted (at minimum, 20,000 words). Bundles and collections that include at least one novel or novella are acceptable. Books must be positively rated (this is discretionary and up to the HG staff - for example, new authors with no ratings, or new books from authors with previously well rated books are usually fine). 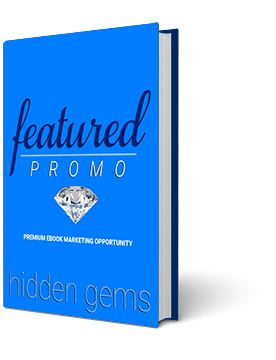 Submissions for a Featured Promotion or Sale Promotion must be temporarily or permanently discounted to $0.99 for the duration of your booking. Submissions for a Free Promotion must be free for the duration of your booking. Books that are not discounted properly sixty minutes before a newsletter is sent will be pulled from promotion and no refunds will be issued. Only one featured book is sold per week - and that book will be on our homepage for the entire week, as well as going out at the top of all 3 of our newsletters for that week. As such, this slot sells out far in advance so plan accordingly. Only 1 Free book is offered per newsletter, and it generally attracts hundreds of clicks. The current FREE offer is also displayed on our homepage. Select a newsletter date that corresponds with your desired promotional period to advertise your 99 cent book to our subscribers. 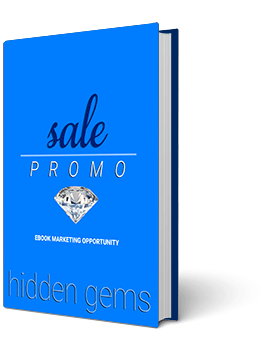 Please note: Hidden Gems makes no guarantees about the number of sales/borrows you will receive during your booking period.